This is why im hot is a hip-hop song by MIMS telling the African to be more confident in themselves. MIMS, who released his debut album, Music Is My Savior, earlier this month, has gotten some extra attention lately because of New York Yankees superstar Alex Rodriguez. So visit the link and see the video if you need some pep talk. Or visit the hot zone if you prefer to know about Kevin''s "World in Conflict"
Among the African Masks the Bassalampasu masks are quite frightening. Also people from this tribe have the reputation to be quite agressive. They cut the teath to make them even more impressive. 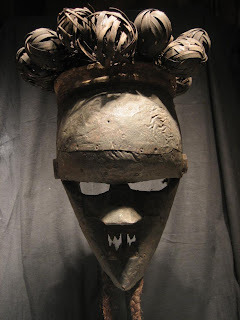 This wooden mask is covered with cupper, and the hairdress is in raffia. The Salampasu are coming from Southern Congo (Kinshasa), this type of mask is called Kasangu. Follow the title link to see more african masks, or to read more about the Salampasu. This mask was collected before 1952, and is to be dated from the 40's. It is yours for 1,500 euros, just send me an email for availability. Do you know who inspired me and ave me the fundaments of my online business? Mark Joyner.